Last summer, three 12-year-old girls from a small indigenous community in Canada made a suicide pact, according to their families. Since then, their families say they have each taken their own lives — the most recent of which was in mid-June. The deaths of the girls from Wapekeka First Nation, a 400-resident indigenous district in northwestern Ontario accessible from the outside only by plane, is highlighting an ongoing struggle to properly address mental health issues within the community. Local leaders declared a state of emergency on June 20, the week after the death, and declared 10 percent of their population at risk of suicides. "The community is in shock, but we're trying to get ourselves going again by working together with the mental health team," Wapekeka Band Councillor Georgina Winters, who was the grandmother of one of the girls, told NBC News. Local leaders said they attempted to help the girls and stop them from carrying out the pact when they found out about it last summer, turning to the Canadian government for suicide prevention and health funding. Suicide is the leading cause of death for indigenous youth and adults up to age 44 in Canada, according to the Centre for Suicide Prevention. The Canadian Broadcasting Corporation reported that Health Canada declined the initial request last September because of "awkward timing" in the federal funding cycle. Then, Wapekeka lost two of the girls to suicide this year: First, Jolynn Winters on Jan. 8; then Chantel Fox two days later. 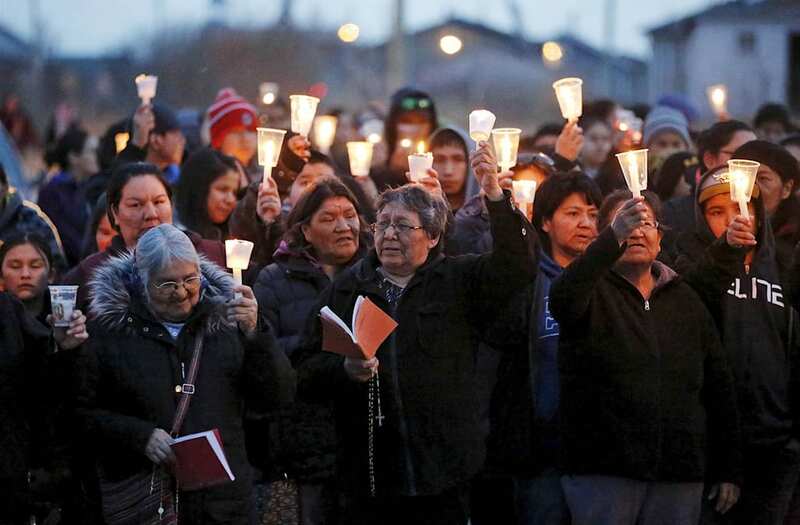 "Those two suicides created a lot of turmoil in that community," Alvin Fiddler, grand chief of the Nishnawbe Aski Nation (NAN) of which the Wapekeka First Nation is a part, told NBC News in a phone interview in June. First Nations is a name by which some of Canada's native peoples are known. "They experienced a number of attempts. Kids were flown out to various parts of the country for assessments and treatment to try to manage what they are experiencing. Then they lost a 12-year-old girl about a week and a half ago," Fiddler said. Jenara Roundsky, the third 12-year-old, was also flown out of the community and put on suicide watch in January after her friends' deaths. She was found dead of an apparent suicide outside of a hockey rink in June, her family said. A statement from her grandparents said that Roundsky suffered from Oppositional Defiant Disorder and added that "we do not blame anyone for the loss of our granddaughter." Suicides continue to be an issue for Wapekeka and the 48 other First Nation communities that make up NAN, leaders say. Since 1986, 523 suicides have occurred among the communities, according to the Nishnawbe Aski Nation, and the highest rate of suicide is among children ages 10 to 14. Wapekeka Chief Brennan Sainnawap sent a letter dated July 18, 2016, to Health Canada requesting help to prevent future suicides. "We are in direct need of addressing some mental health needs and support," the letter said. "We have had some dire experiences with youth suicides in the past and we are hoping to establish support systems in place to help out our young people in their mental health struggles." The requested budget in the letter included salaries and benefits for four mental health workers, their rent, training, materials, travel, computers and networking for a total of $376,706. Health Canada did not fulfill the request until May 9 of the following year, leading to criticism that they ignored a plea for help. But, according to Health Canada, they did not receive the letter until September, and even then it was sent to the wrong office. "We didn't say no," Health Canada Senior Media Advisor Maryse Durette told NBC News. "The letter was submitted after much of our budget had already been earmarked. We just needed to find a new way to fund it." To make up for last year's funding, they provided Wapekeka with $95,000 for the remaining months of 2016 and has sent the $380,000 for 2017. According to Durette, Wapekeka already cashed the check for the $380,000 and the four mental health workers have been hired. The NAN, however, accused Health Canada of only contributing $95,000. Durette said it must have been a misunderstanding. If so, it is a longstanding misunderstanding and sense of government mistrust that many say is born out of the residential schools that indigenous people were forced to attend as a means to assimilate — from the 19th century until the last school shut its doors in 1996. The scars of those schools are still etched deep on indigenous communities across Canada, and aboriginal groups, as well as the Canadian government, believe them to be major reason for the mental health crisis. Residential schools had high rates of physical and sexual abuse and forced a devaluation of their native culture, causing difficulties in early childhood development, according to Dr. Laurence Kirmayer, the director of McGill University's Division of Social and Transcultural Psychiatry, which focuses on the mental health care of indigenous people, immigrants and refugees. "It changed how people dealt with child rearing, it changed how people dealt with distress, it had an indirect impact on parenting and had a large effect when people found their way back to the community," Kirmayer told NBC News. And that impact has not disappeared, continuing to affect the newest generation of indigenous Canadians, he said. "Studies show that the more generations of your family were exposed to residential schools, the more susceptible you are to distress and perhaps even suicide," Kirmayer added. This is an issue that is not limited to Wapekeka and the First Nations' children. The suicide rate of the Inuit youth in Canada is 11 times higher than the national average and among the highest in the world, the Centre for Suicide Prevention reported. Among First Nation male and female youths (15-24) the suicide rate is more than five and seven times higher respectively than the national average, according to the Centre. A national survey of First Nations communities conducted between 2008 and 2010 found that members believed alcohol and drug abuse was their number one challenge (83 percent). Housing (71 percent) and employment (66 percent) were the two other concerns. The last Aboriginal Economic Progress Report, released in 2015 by the National Aboriginal Economic Development Board, concluded that the number of First Nations people on reserves with a job in Canada had dropped from 39 percent to 35.4 percent between 2006 and 2011. Kelvin and Tunchai Redvers, siblings and members of the First Nations, have taken note of the growing number of suicides in their community and are attempting to combat it with their We Matter campaign. The nonprofit encourages communication by providing a forum for people to share their own experiences and positive messages. While they have a number of success stories, the Redvers explain there is an ongoing problem because there is no single source for the suicides — it's a series of problems that the First Nations face. "When it comes to [indigenous] youth suicide it definitely comes down to a sense of hopelessness," said Tunchai Redvers. "Historical traumas are of one of the factors, but there are so many issues that a young person faces including intergenerational trauma, mental health, bullying, addiction, lack of opportunity, issues in the home and community." Keaden Balsille, 13, is a member of Deninu K'ue First Nation in Fort Resolution, Northwest Territories. He said he nearly killed himself last year until he called a helpline. Balsillie said he was particularly depressed after his cousin committed suicide on the reservation, and he knows that other communities are struggling as well. Now, the 13-year-old wants to help those people who are depressed or having a tough time and is participating in the We Matter campaign. "I want people instead of thinking about the bad things, think about the things that motivate you and the people who you've lost," he told NBC News. "Think about what they want. Always try to stay happy, even when it's not the best times."